Virginia Distillery Company is an American Single Malt Whisky distillery on 100 acres amongst the Blue Ridge Mountains in Nelson County, Virginia. We are centrally located between Charlottesville & Lynchburg on Route 29. Courage & Conviction, our American Single Malt whisky, is currently being produced on-site using malted barley from the U.S. and water from Virginia’s Blue Ridge Mountains. Sherry, Cuvée and Bourbon casks are used to age this unique whisky. It will be released in the Spring of 2020. While we wait for Courage & Conviction to age, enjoy our Virginia-Highland Whisky series, made from 100% malted barley. These whiskies showcase both Old World and New World whisky making. 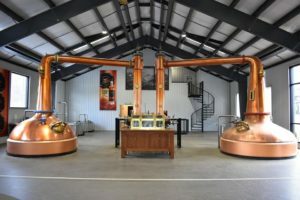 Virginia Distillery Company marries single malt whisky made on-site in Virginia with aged malt whisky from Scotland. A focus on cask finishing adds depth and complexity.